Drawing from Dr. David A. Sousa's book How the Brain Learns Mathematics (not included), this user-friendly resource provides ready-to-use mathematics lessons for second and third grade classrooms. Step-by-step lessons feature an objective, introduction, modeling, understanding check, guided practice, lesson closing, and homework. Through activities such as Jumping Jelly Beans, Math Hockey, and Treasure Hunt, young learners will enjoy developing skills connected with number patterns, place value, multi-digit addition, subtraction, multiplication, division, fractions, measurement, geometry, and more. Activities are designed to address individual intelligences, use concrete models to help make concepts meaningful, connect math to the real world, and teach creative problem solving. 200 pages. Reproducible activity pages included. Aligned with NCTM standards and focal points. Line-listed answer key provided. Grades 2-3. Demonstrating instructional principles discussed in David A. Sousa’s How the Brain Learns Mathematics, this resource provides brain-friendly, ready-to-use mathematics lessons for Grades 23. Teachers will find step-by-step guidance and all the necessary reproducible materials for mathematics instruction that involves group work, reflection, movement, and visualization. Through activities such as Jumping Jelly Beans, Math Hockey, and Treasure Hunt, young learners will enjoy developing skills connected with number patterns and place value, multi-digit addition and subtraction, multiplication and division, fractions, measurement, geometry, and more. Dr. David A. Sousa is an international consultant in educational neuroscience and author of fifteen books. A member of the Cognitive Neuroscience Society, he has conducted workshops in hundreds of school districts on brain research, instructional skills, and science education at the Pre-K to 12 and university levels. He lives in Fort Lauderdale, Florida. 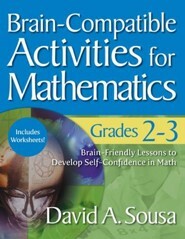 I'm the author/artist and I want to review Brain-Compatible Activities for Mathematics, Grades 2-3.